If there's one thing that Catholics from the Albany Diocese agree on, it's the fact that New Yorkers seemed remarkably friendly during Pope Francis' stop there amid his historic visit to the United States. "A lot of times in New York [City], you don't make eye contact, but everybody was talking to each other," said an impressed Sister Veronica Robert, O.Carm. Sister Veronica, who is treasurer for her order of Carmelite sisters, won a drawing at the sisters' motherhouse in Germantown for tickets to the Sept. 25 papal Mass at Madison Square Garden. She headed to the Big Apple with Sister Cyril Methodius, O.Carm. "Everybody was more aware of the need for prayer," Sister Veronica concluded. Rev. Joseph O'Brien, pastor of Holy Spirit parish in East Greenbush, said he, too, would "never forget how happy the people were in New York City that day. Having lived in New York, it's not always like that!" "My goosebumps have just receded," declared Deacon Michael Melanson of Immaculate Conception parish in Glenville, days after attending the MSG liturgy. "It was unbelievable." Of the group with whom The Evangelist spoke, Father O'Brien was the first to arrive in New York on Sept. 25. He took a Megabus that hit the city at 10 a.m., with only about a 10-minute walk to MSG. The pastor took his time, chatting with many of the tens of thousands who had descended on the city in the hope of seeing the pope -- whether they had tickets for events or not. 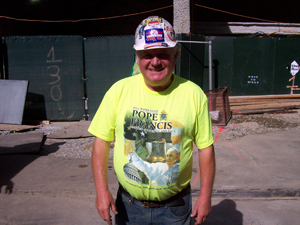 A construction worker from County Sligo, Ireland, told Father O'Brien that fellow workers were "really very impressed" with Pope Francis; a mother and daughter from Syracuse said they'd both managed to get tickets through a parish lottery because the mother used a wheelchair and needed her daughter to help her navigate the city streets. Among visitors wearing Pope Francis t-shirts and hats, said Father O'Brien, a quick, "Are you going?" was all the shorthand needed to indicate they were all heading to the papal Mass. Father O'Brien thought he reached MSG in plenty of time for the 2 p.m. opening, but the line already stretched 12 blocks. It took him three hours to finally get inside, but his seat turned out to be only 100 feet from the pope. 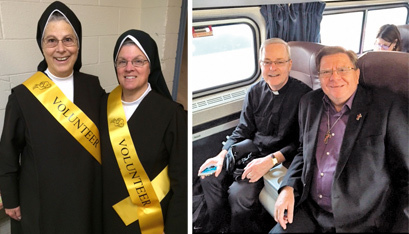 Meanwhile, Sisters Veronica and Cyril had arrived in Penn Station on an Amtrak train around 11 a.m. They, too, entered the long line, but were fortunate to cross paths with a relative of their order's foundress, who asked if they would volunteer for tasks before the Mass. "We said, 'Sure!' We didn't know what we were volunteering for," but getting inside MSG quickly made it an obvious choice, Sister Veronica remarked. The sisters ended up unpacking boxes and handing out Mass programs and other items to arriving pilgrims, many of whom stopped for a moment to chat. Deacon Melanson was also pulled out of line: He was traveling with Rev. Jerome Gingras, pastor of Immaculate Conception parish in Glenville, who was asked to hear confessions inside the arena. The pair had walked from Penn Station, having arrived on an afternoon train with the mistaken idea that they could head straight upstairs to MSG. Those stairs were blocked off for security reasons. The deacon said it took 45 minutes to get through the security checkpoint. Father Gingras took up a station along with other priests scattered around the stadium and heard 30 or 40 confessions, while Deacon Melanson enjoyed the pre-Mass music and the Rosary, which was prayed in several languages. When Pope Francis finally arrived and Mass began, each of the Albany Diocese Catholics shared a similar reaction. Father O'Brien was seeing a pope in person for the first time. "It was emotional, and the emotion was wonder and joy," he told The Evangelist. "It was a tremendous experience. The long wait wasn't really in my mind. It was joyful; it was prayerful -- and, seeing how diverse the crowd was, it was a true sense of how wonderful the people of God are." The pastor pointed out that the pope's homily referred to Isaiah 9:1: "The people who live in darkness have seen a great light." "He was talking about the experience of God being present on our streets." That had been obvious to Father O'Brien; the people he'd met in the city "were just very much at peace." Sister Veronica recalled seeing St. Pope John Paul II during a U.S. visit and bursting into tears. At MSG, she expected the same thing to happen, "but it was more of a quiet enthusiasm and joy. "There's more of a lightness" to Pope Francis, she explained, "with his sense of humor. I felt so blessed to be in his presence." So did Deacon Melanson. He shared that his wife, Peggy, has terminal cancer, and she'd asked over and over again that, when the pope offered a blessing, her husband hold up her picture. That moment arrived, and "it was very emotional for me," the deacon said. "I just kind of lost it." The couple had been speaking by phone before the Mass, so he knew Mrs. Melanson "was teary-eyed, too." Young people traveling to the Mass from the Albany Diocese had been told that they were "seeing their pastor," the pope (read separate story on page 1). That was true for Father O'Brien: "There was just the sense that he is our Holy Father and he is so truly our pastor. He projects what it means to be a pastor for the people." Pope Francis inspired Sister Veronica, as well. She liked his message of simplicity: "I've been in the grocery store and thought, 'Do I really need this, or need this many of this?'" And as treasurer for her order, she said, "I don't get out with the people as much as others." The pope's homily made her wonder, "Could I be doing more, maybe on my day off?" Several of the tired pilgrims fell asleep on the train home, but they seemed to share Father O'Brien's summary of the experience: "What a wonderful day."